The global economic crisis and the crisis in the euro zone exposed the deep differences of opinion between German economists and scientists from Anglo-Saxon countries. The German approach conceptually differs in the views on the strategies and tools of anti-crisis policy, especially fiscal stimulus in the Keynesian-style, quantitative easing monetary policy of the ECB, the question of financial assistance to Greece and restructuring its debt. The other areas of difference are the approach to the rules in macroeconomic policy, fiscal consolidation, and interpretation of current account surplus. Given the size and performance of the German economy it is important to understand the reasons for these opposites, which constitute the research goal of this article. 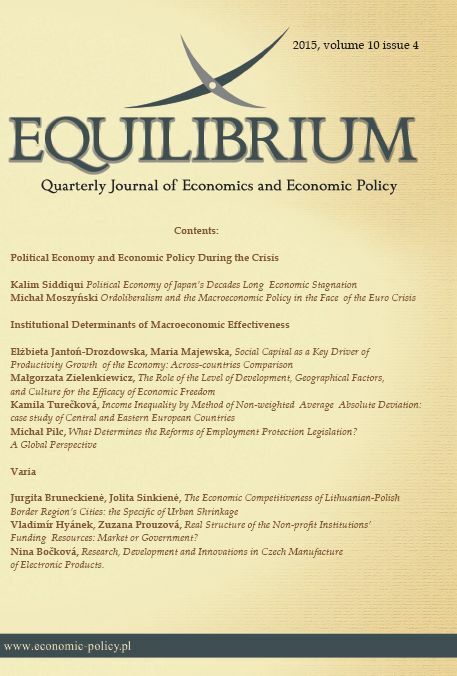 Considerations are based on the thesis that ordoliberal thought still has a strong impact on the practice of macroeconomic policy in Germany and also at the European level. The analysis is built on the short overview of ideological foundations of the German social market economy and its most important postulates, which then will be applied for interpretation of intellectual distinctions between economists from Germany and other countries in the theoretical and practical dimensions of the economic policy observed in Europe. The methodology includes the critical literature studies and the comparative analysis of macroeconomic policy through the prism of economic thought. Afhüppe S. & Steingart G. (2015). Kanzler der Vernunft. Handelsblatt, 24-26.07. Allen, Ch. S. (2005). “Ordo-Liberalism” Trumps Keynesianism: Economic Policy in the Federal Republic of Germany and the EU. In: B. H. Moss (Ed.). Monetary Union in Crisis The European Union as a Neo-liberal Construction. New York: Palgrave MacMillan. Balcerzak, A. P. (2009a). Przegląd i wstępna ocena teoretycznych stanowisk dotyczących źródeł globalnego kryzysu gospodarczego. In: S. Antkiewicz, M. Pronobis (Eds.). Gospodarka w warunkach kryzysu. Warszawa: Wydawnictwo Naukowe CeDeWu.pl. Balcerzak, A. P. (2009b). Wpływ działalności regulacyjnej państwa w obszarze kreowania ładu konkurencyjnego na rozwój nowej gospodarki. In: A. P. Balcerzak, M. Moszyński (Eds.). Aktywność regulacyjna państwa a potencjał rozwojowy gospodarki. Toruń: Polskie Towarzystwo Ekonomiczne Oddział w Toruniu. Balcerzak, A. P. (2008). Współczesna polityka stabilizacyjna wobec problemów informacyjnej nieefektywności decydentów gospodarczych: przypadek Stanów Zjednoczonych. Zeszyty Naukowe Polskie Towarzystwo Ekonomiczne, 6. Balcerzak, A. P. & Rogalska E., (2014). Crowding Out and Crowding in within Keynesian Framework: Do We Need Any New Empirical Research Concerning Them?. Economics & Sociology, 7(2). DOI: 10.14254/2071-789X.2014/7-2/7. Bombach, G., Netzband, K. B., Ramser, H.-J. & Timmermannet, M. (Eds.) (1983). Der Keynesianismus IV, Die beschäftigungspolitische Diskussion in der Wachstumsepoche der Bundesrepublik Deutschland. Berlin, Heidelberg, New York: Springer-Verlag. Braithwaite J. (2008). Regulatory Capitalism, How it Works, Ideas for Making it Work Better. Cheltenham, Northampton: Edward Elgar. De Grauwe, P. (2005). Economics of Monetary Union, 6th ed. New York: Oxford University Press. Die Aktualität Euckens, Ein Gespräch zwischen Ernst-Joachim Mestmäcker und Walter Oswalt. In: Eucken (2004). Grundsätze der Wirtschaftspolitik, Mohr Siebeck. Tübingen. Dullien, S. & Guérot U. (2012). The Long Shadow of Ordoliberalism: Germany’s Approach to the Euro Crisis. ECFR, 49. Eucken, W. (2004). Grundsätze der Wirtschaftspolitik. Tübingen: Mohr Siebeck. Frankfurter Allgemeine Zeitung (2015) Schäuble will EU-Kommissionentmachten. 30.07. Frankfurter Allgemeine Zeitung (2012). Der offene Brief der Ökonomen im Wortlaut, 05.07. Godłów-Legiędź, J. (2014). Ideologia liberalna i keynesowska z perspektywy globalnego kryzysu. In: P. Pysz, A. Grabska & M. Moszyński (Eds. ), Ład gospodarczy a współczesna ekonomia. Warszawa: PWN. International Monetary Fund (2013). Greece: Ex Post Evaluation of Exceptional Access under the 2010 Stand-By-Arrangement. IMF Country Report, 13/156. Issing, O. (2000). Walter Eucken: vom Primat der Währungspolitik, Lecture at The Walter-Eucken-Institut. Retrieved from https://www.ecb.europa.eu/press/key/ date/2000/html/sp000317_2.de.html (20.06.2015). Issing, O. (2011). Der Weg in die Knechtschaft. Frankfurter Allgemeine Zeitung, 11.12. James, H. (2015). Teutonische Obsessionen. Handelsblatt, 05.08. Kant, I. (1793). Die Religion innerhalb der Grenzen der bloßen Vernunft. Königsberg: Friedrich Nicolovius. Kohl, H. (1992). Bilanzen und Perspektiven, Regierungspolitik 1989-1991, Band 1. Bonn: Presse- und Informationsamt der Bundesregierung. Legrain, P. (2015). The Last Thing the Eurozone Needs Is an Ever Closer Union. Foreign Policy 31.07. Retrieved from https://foreignpolicy.com/2015/07/ 31/france-plan-eurozone-integration-is-a-bad-idea. (31.07.2015). Lesch, H. (2010). Lohnpolitik 2000 bis 2009 – Ein informelles Bündnis für Arbeit. IW-Trends, 1. Mączyńska, E. & Pysz, P. (2014). Liberalizm, neoliberalizm i ordoliberalizm. Ekonomista, 2. Moszyński, M. (2013). Problemy teorii i polityki konkurencji w myśli ordoliberalnej. Ekonomia i Prawo, 12(2). DOI: http://dx.doi.org/10.12775/EiP.2013.017. Newman, A. (2015). The Reluctant Leader. Germany’s Euro Experience and the Long Shadow of Reunification. In: M. Matthijs, M. Blyth (Eds.). The Future of the Euro. Oxford: Oxford University Press. Poirson H. & Weber S. (2011). Can Germany be Europe’s engine of growth? Retrieved from http://www.voxeu.org/article/can-germany-be-europe-s-engine-growth, (15.07.2015). Posen, A. S. (2011). The Euro Payoff: Germany's Economic Advantages from a Large and Diverse Euro Area. Peterson Institute for International Economics. Retrieved from http://www.iie.com. (30.07.2015). Pysz, P. (2008). Społeczna gospodarka rynkowa. Ordoliberalna koncepcja polityki gospodarczej. Wydawnictwo Naukowe PWN, Warszawa. Pysz, P. (2010). Komplementarność i synteza koncepcji polityki gospodarczej Waltera Euckena i Ludwiga Erharda. In: E. Mączyńska, P. Pysz (eds.). Idee Ordo i Społeczna Gospodarka Rynkowa. Warszawa: Polskie Towarzystwo Ekonomiczne. Schäuble, W. (2012). Building a Sturdier Euro. The euro's original design created lopsided incentives for its weakest members. Wall Street Journal, Retrieved from www.wsj.com/articles/SB10001424127887323981504578174812451337 722 (03.06.2015). Schäuble, W. (2015). Wolfgang Schäuble on German Priorities and Eurozone Myths. New York Times, Retrieved from www.nytimes.com (15.04.2015). Sennett R., (2006). The Culture of the New Capitalism. London: Yale University Press, New Haven. „The Economist” (2015a). Austere? Your word, not ours. 18.07. „The Economist” (2015b). Germany and economics, of Rules and Order. 09.05. US Treasury Department (2013). Report to Congress on International Economic and Exchange Rate Policies. 30.11. Weidmann J. (2012). Finanzsystemstabilität und nachhaltiges Wachstum. Retrieved from www.bundesbank.de/Redaktion/DE/Reden/2012/2012_11_29_weid mann_finanzstabilitaet.html (20.07.2015). Wiegel M. (2015). Hollande will eine „Wirtschaftsregierung“ für Europa. Frankfurter Allgemeine Zeitung. 14.07. Wolf, M. (2013). Germany’s strange parallel universe. www.ft.com, 24.09. Young, B. (2015). The battle of ideas in the Eurozone crisis management German ordoliberalism versus post-Keynesianism. In: S. Fadda P. Tridico (Eds.). The Economic Crisis in Social and Institutional Context Theories, policies and exit strategies. London, New York: Routledge.